It that time again! 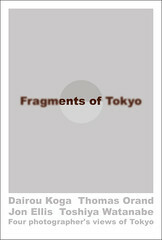 Next week the third Fragments of Tokyo exhibition will be hanging at the Place M Gallery in Shinjuku, Tokyo. We had planned for this year to be five members, Toshiya Watanabe, Thomas Orand, Diarou Koga, Sean Wood, and myself, but somewhere along the way Koga-san gained a son (congratulations!) and we lost a contributor. The end result is that we’re still doing a four man show and hopefully we have enough photography to make it worth making the trip to the gallery. My contribution this year is a little reduced, just six prints. But, they are, in my opinion, six very nicely printed pieces. As i’m a beginner in the darkroom, and really didn’t have time to focus on improving (it has been a busy year…), they’ve been done professionally by Larry at Lazurus Fine Print. And, i just got back from Japan two weeks ago. Which means that sadly i won’t be there for the show. It feels a little odd to be doing this and not turning up, but it’s just the way that things worked out this year. Anyway, please visit the show if you can. There will be an event next Saturday (pretty sure) where everyone else will be there. Maybe even Koga-san! 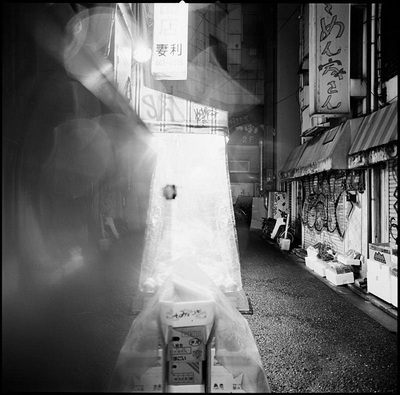 If you’re around in Tokyo at the start of this month please go visit Watanabe-san’s ‘3 months later‘ exhibition in Harajuku. 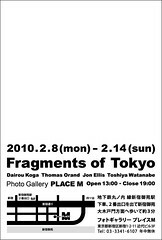 As i’m sure most of you know, Watanabe-san is a good friend, and member of our little ‘Fragments of Tokyo’ exhibition team. These photographs (or at least those that i’ve seen) are incredibly haunting, and well worth seeing. My initial reaction to them was to attempt to get them seen by a much wider audience. For various reasons (conflicting priorities on my side) that never happened, and i’m therefore especially happy that he’s putting on this show. 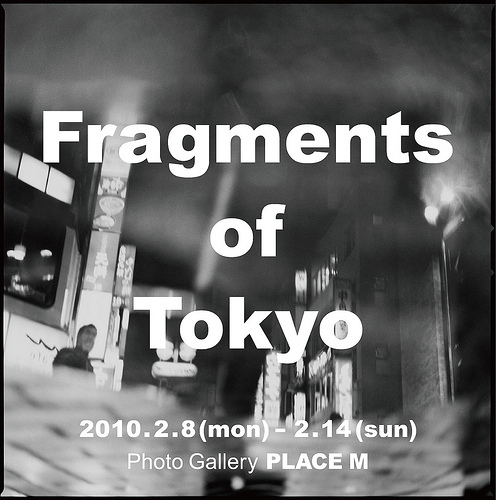 My first photography exhibition is opening next week, Monday, 8th of February, and is up until Sunday, the 14th. We are having a little soiree on Thursday afternoon (what is a soiree in the afternoon called? ), the 11th. It’s a national holiday (建国記念日 – founding of the nation day) so hopefully a few people will be able to drop by, have a glass of wine, and a chat. The gallery (Place M) is open from 1pm, but that’s not a particularly civilised time to start drinking… so how about 3pm? Oh, and don’t get your hopes up, we’re not – so there won’t be cases of wine! I’m putting up nine pictures… or maybe ten… or eight… won’t really know until i see them on the wall. It has been quite the experience getting from negatives to getting A2 prints hung on a wall. Along the way i’ve lost a little sleep, worried and drunk too much, and acquired a printer. Here’s hoping that it’ll be easier next time… assuming there is a “next time”. It’s great having talented friends.